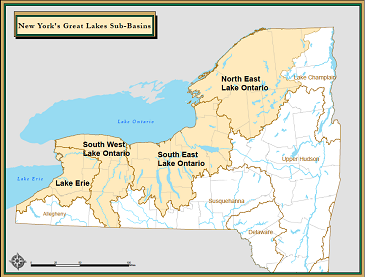 for a presentation by Natural Heritage Program on a new riparian restoration and protection planning tool created especially for New York's Great Lakes basin. Four sub basin work groups provide a unique opportunity to connect, coordinate and collaborate with other groups and agencies working locally and basinwide. 8477 E. Mud Lake Rd. All NYS Great Lakes stakeholders are invited to participate -- including environmental orgs, academic institutions, state and federal agencies, local government, individuals and other diverse stakeholder groups (business, health, recreation, planning, etc). Please let us know if you can make it! RSVP to greatlakes by February 29th. Please indicate which work group meeting you'll be attending.